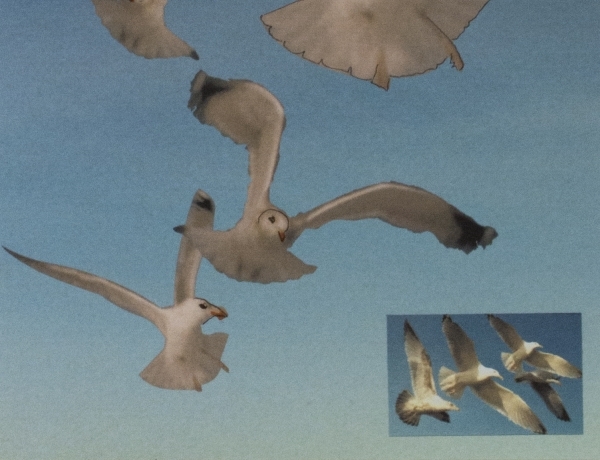 Gaa Gallery is pleased to present a solo exhibition of work by visual artist Peter Hutchinson, with an opening reception on April 4, from 6-8pm, at the Gaa Projects Cologne, located at Große Brinkgasse 8, 50672 Cologne, Germany. This exhibition is on view through May 18. For over 60 years, Hutchinson has created a diverse body of work that integrates sculpture, photography, and text with site-specific installations and environmental interventions. Hutchinson was an early pioneer of the land art movement, along with peers Robert Smithson and Dennis Oppenheim, and his work has been exhibited in galleries, museums, and institutions worldwide. Hutchinson’s exhibition at the Gaa Gallery Project Space Cologne showcases early works from the 1960s and 70s, as well as more recent photo-collages. Peter Hutchinson (b. 1930, London, England) graduated from the University of Illinois at Champagne-Urbana in 1960 with a BFA in Painting. Hutchinson’s early work emerged out of minimalist paintings and geometric sculptures that drew influence from Sol LeWitt and Tadaaki Kuwayama. In the late 1960s and early 70s, with the realization of several earthworks, including the Parícutin Project, Hutchinson’s work quickly evolved into an intricate hybrid of site-specific sculptures, photo-collages, and proposals for re-imagined landscapes. 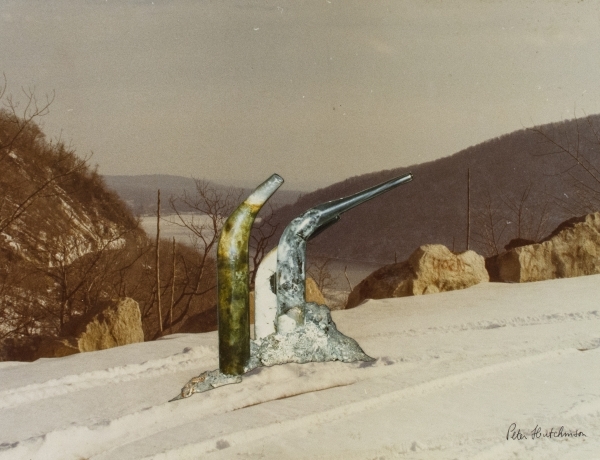 During this time Hutchinson’s work was featured in several groundbreaking exhibitions, including: Ocean Projects with Dennis Oppenheim at the Museum of Modern Art, New York, NY and Ecologic Art at the John Gibson Gallery, New York, NY, which established him as an early and prominent figure in the Land Art and Narrative Art movements. Drawing comparison to the action-based work of colleagues such as Hamish Fulton and Richard Long, Hutchinson’s work is primarily produced in solitude. 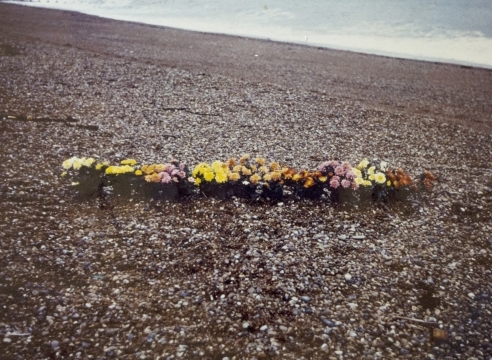 While sometimes resembling performances made for the camera, Hutchinson’s ephemeral interventions with monumental landscapes from his many travels around the world, as well as the micro-landscapes of his overflowing garden in Provincetown, MA, embody a nuanced and joyful engagement with nature. Pairing personal observation with science fiction, experimentation, and humor, Hutchinson produces both physical and metaphysical impressions of the landscape and the natural world that mine the interrelated qualities of nature and language. Peter Hutchinson lives and works in Provincetown, MA USA. Recent solo exhibitions include Centre Pompidou-Metz, Metz, France; Frac Bretagne, Rennes France; and the Arp Museum Bahnhof Rolandseck, Remagen, Germany. His work can be found in the collections of Musée d’Art Moderne Centre George Pompidou, Paris, France; Museum of Contemporary Art, Basel, Switzerland; Museum of Fine Arts, Boston, MA; Museum Ludwig, Cologne, Germany; Museum of Modern Art, New York, NY; National Gallery of Art, Washington, D.C.; New Museum, New York, NY; Philadelphia Museum of Art, Philadelphia, PA; Stedelijk Museum, Amsterdam, Netherlands; Wadsworth Atheneum, Collection of Sol Lewitt, Hartford. Congratulations to Peter Hutchinson whose work was selected for inclusion in the 2019 Invitational Exhibition of Visual Arts at the American Academy of Arts and Letters. The exhibition will be on view from March 7 to April 7, 2019, at the American Academy of Arts and Letters, 633 West 155th Street, New York, NY.